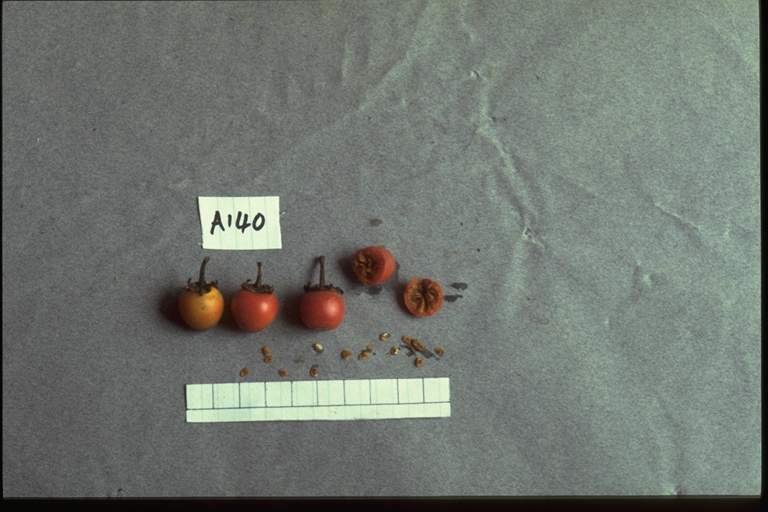 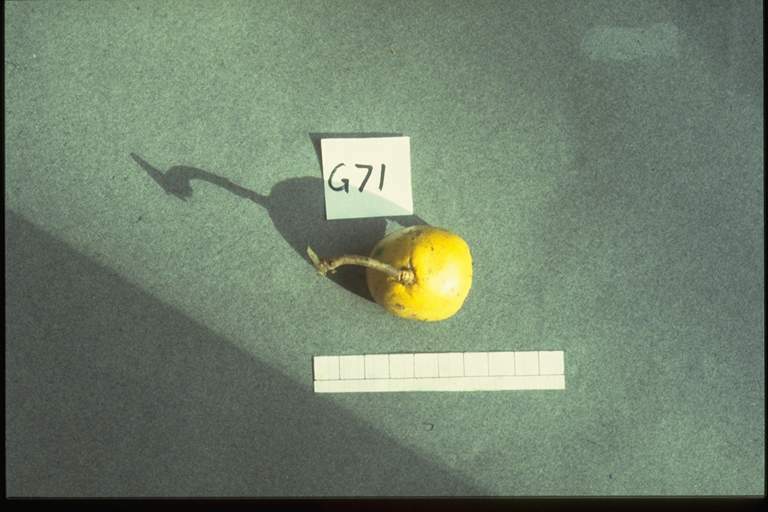 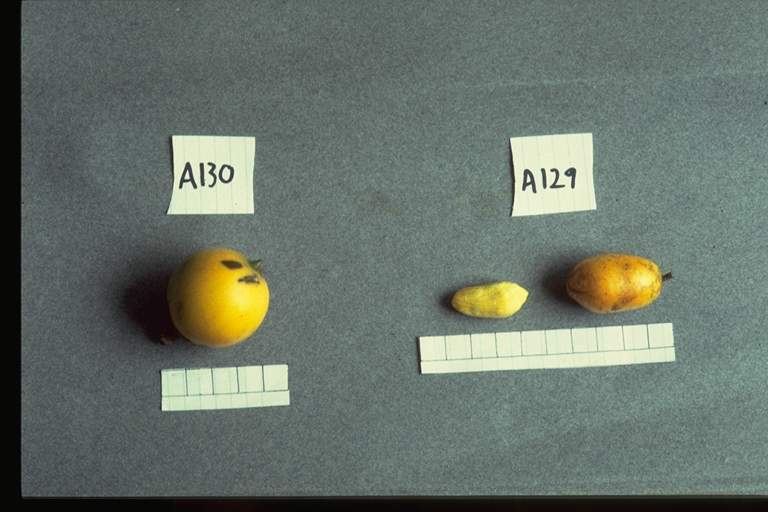 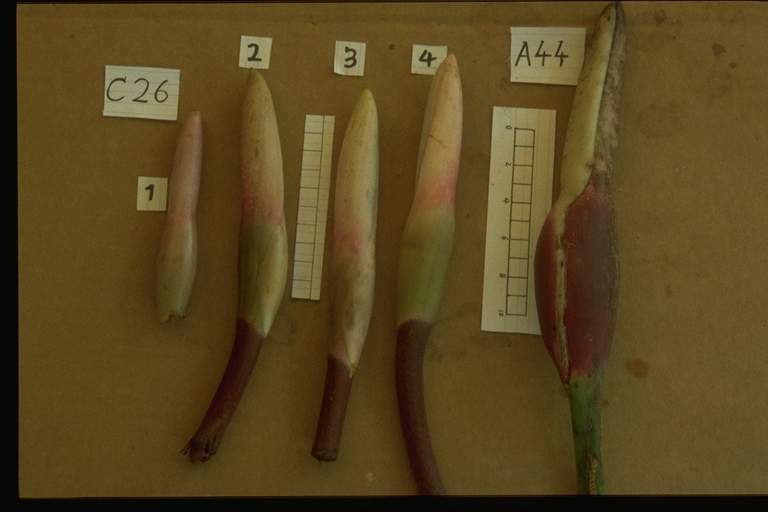 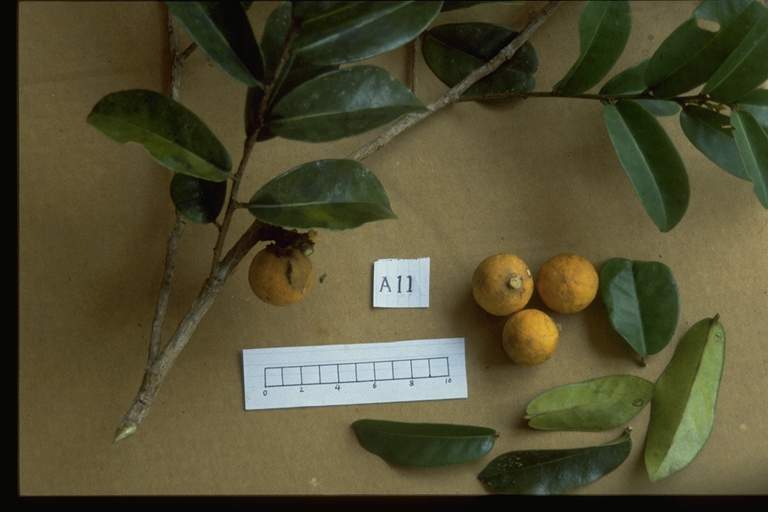 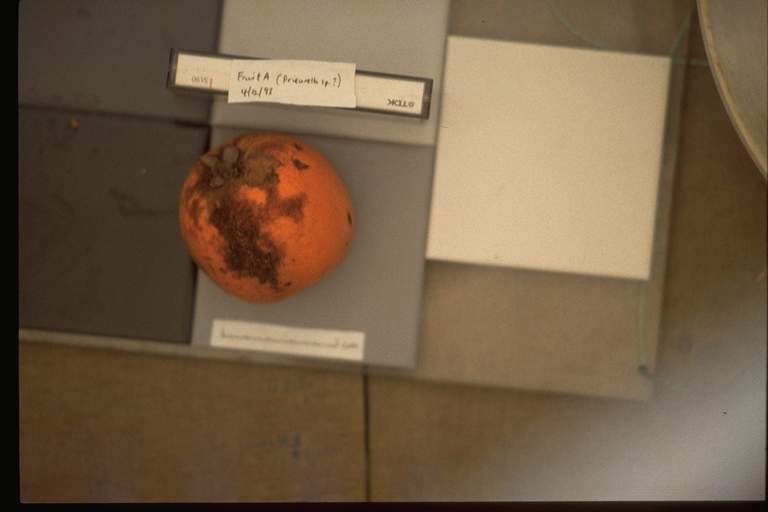 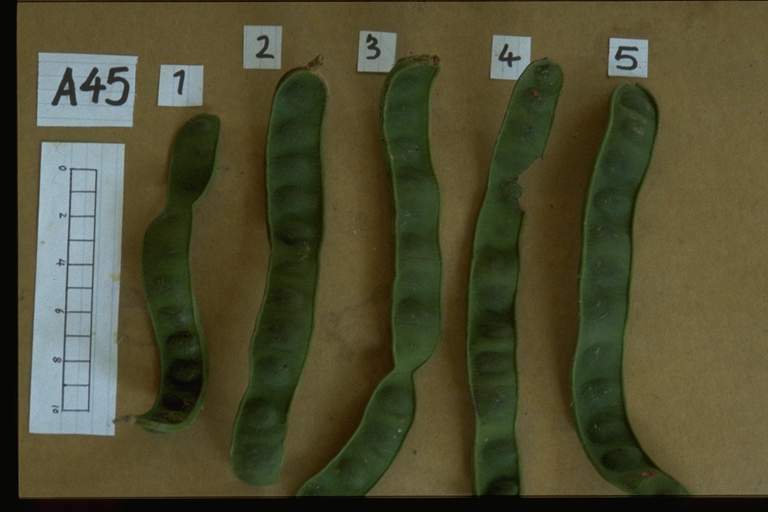 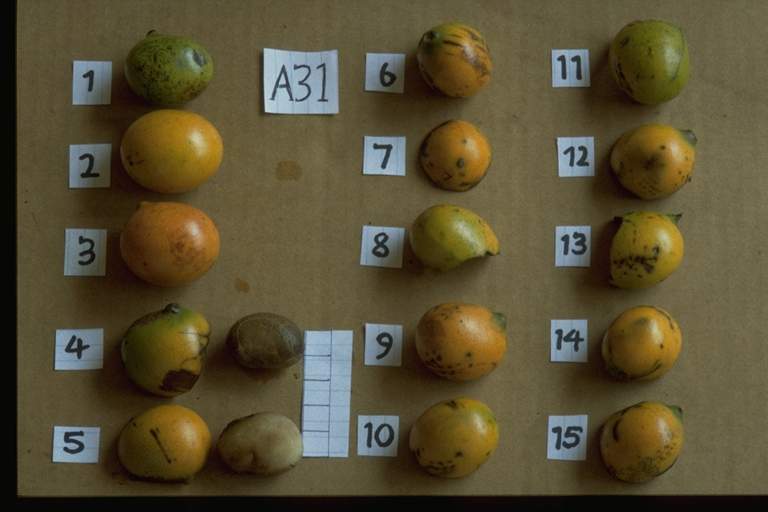 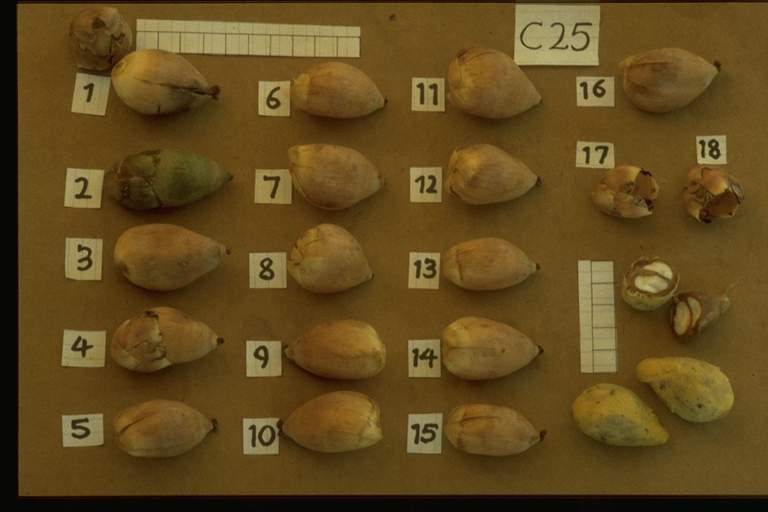 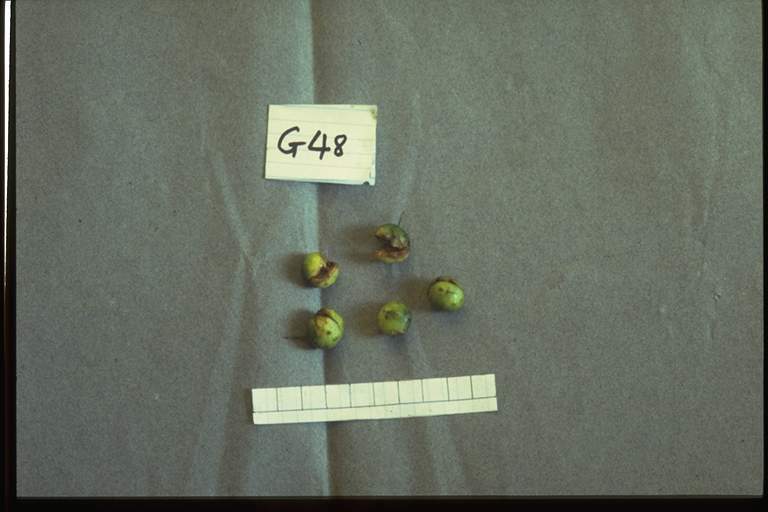 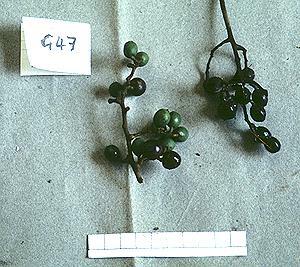 The fruit data given in this table and in the accompanying text file of spectra were all collected at the Nouragues field station in French Guiana, 4 05' N, 52 40' W, between March 1993 and May 1995. 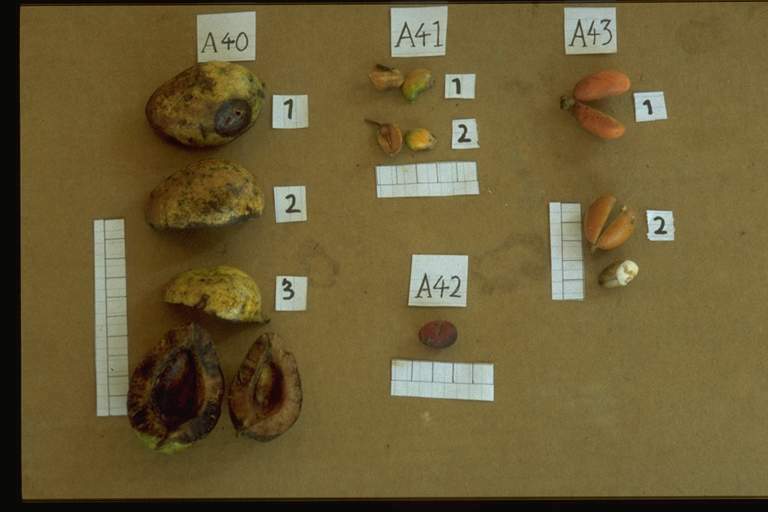 We have indicated which primate species at Nouragues have been observed to consume each fruit. 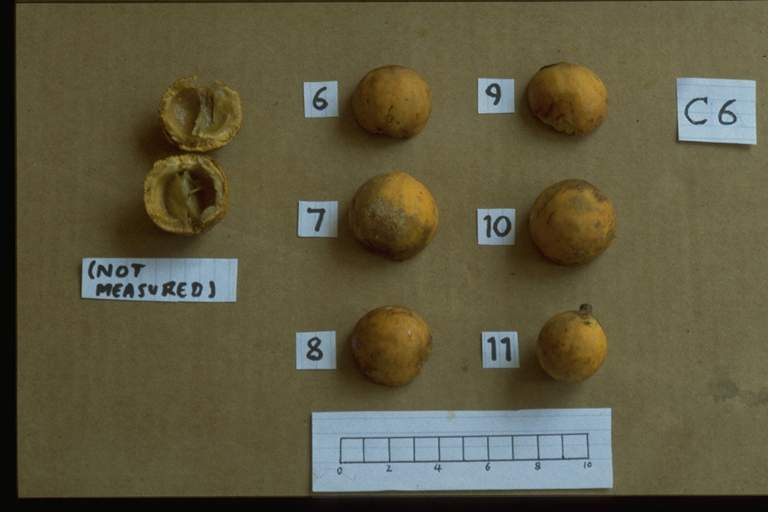 Not all the fruits listed here have been seen to be consumed by primates: obviously this does not necessarily mean that primates do not ever consume such fruits. 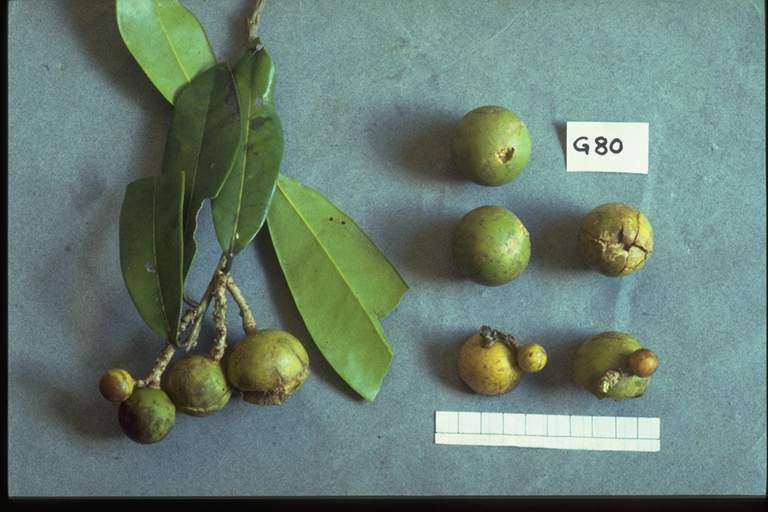 Consumption data were gathered from observations of primates at Nouragues by Ben Regan, Catherine Julliot and Bruno Simmen, and from published data (see references). 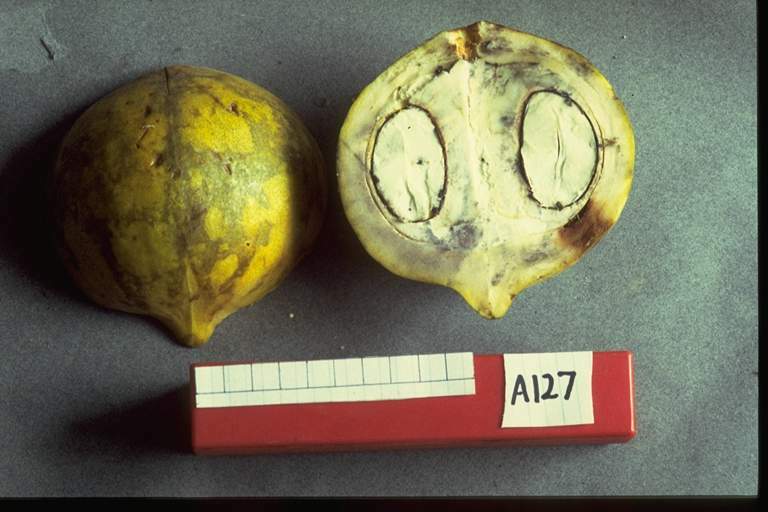 Primates at Nouragues have not been observed eating this fruit. 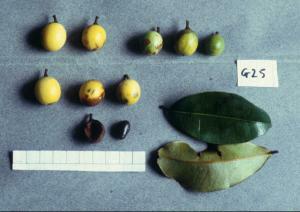 Fruit consists of a true fruit (a hard brown nut) topped with a yellow, fleshy false fruit derived from the receptacle. 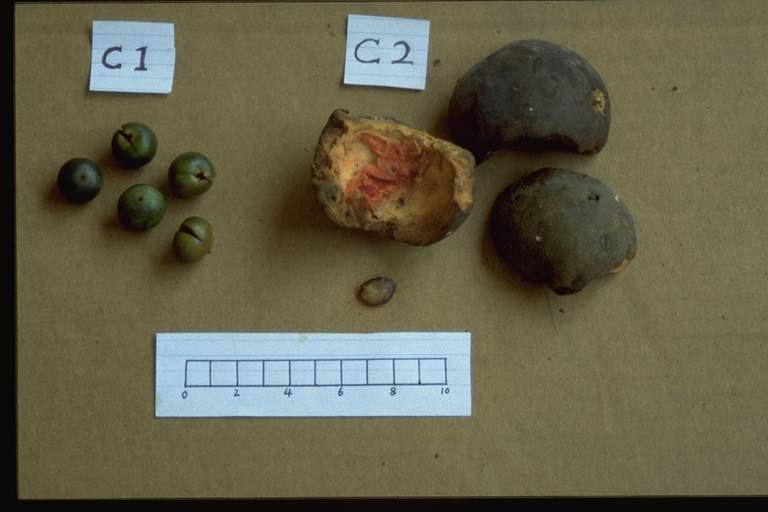 Eaten by Alouatta seniculus, Ateles paniscus, Cebus apella. 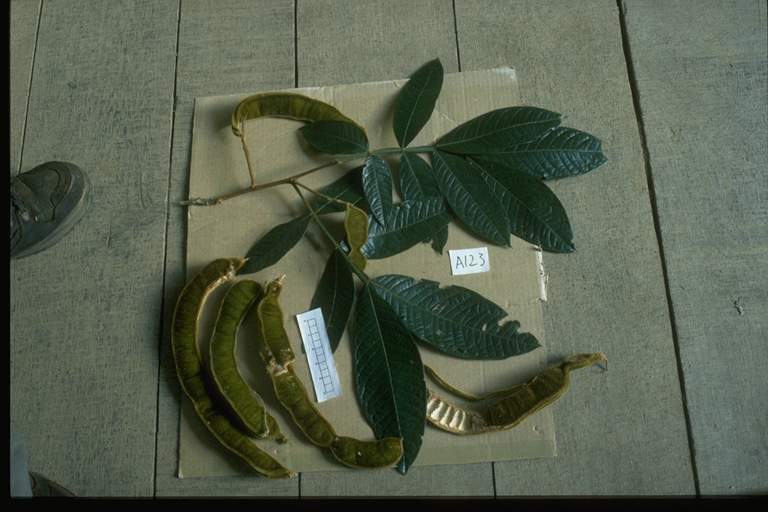 Eaten by Ateles paniscus, Cebus apella. 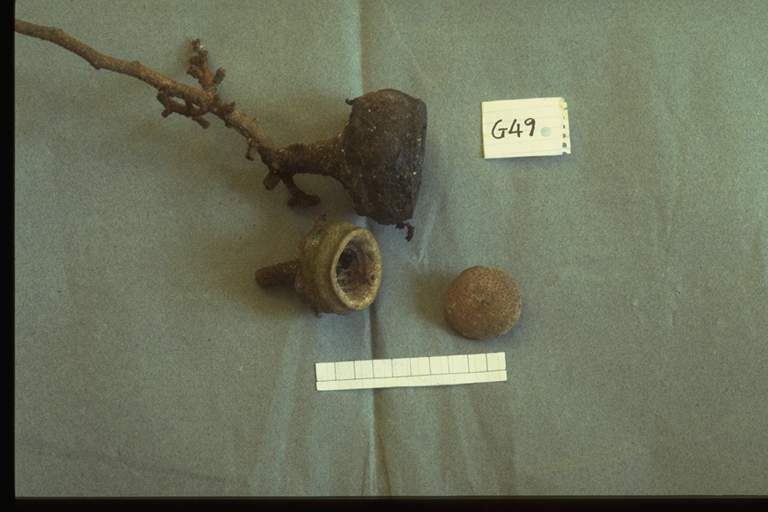 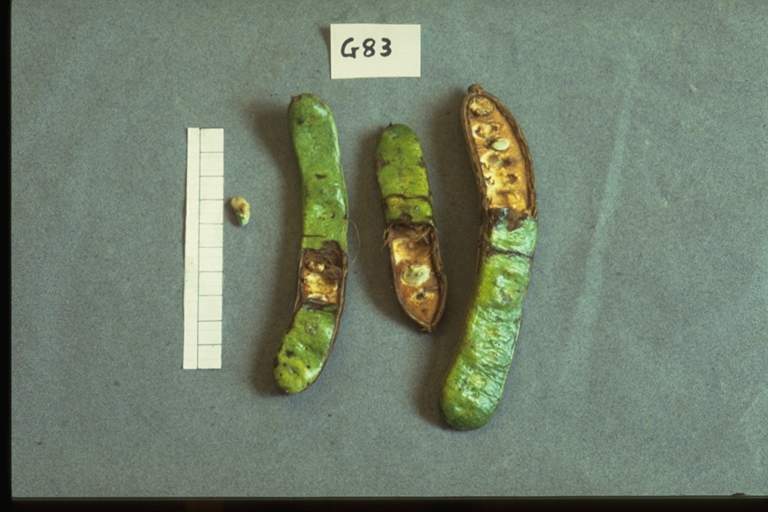 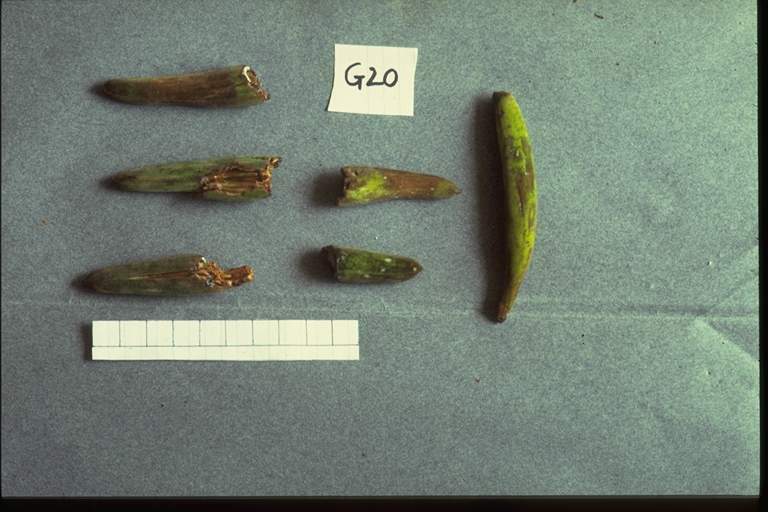 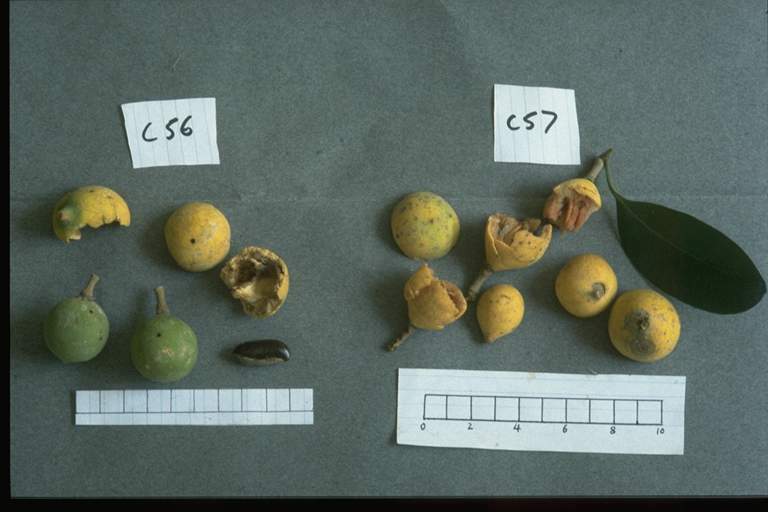 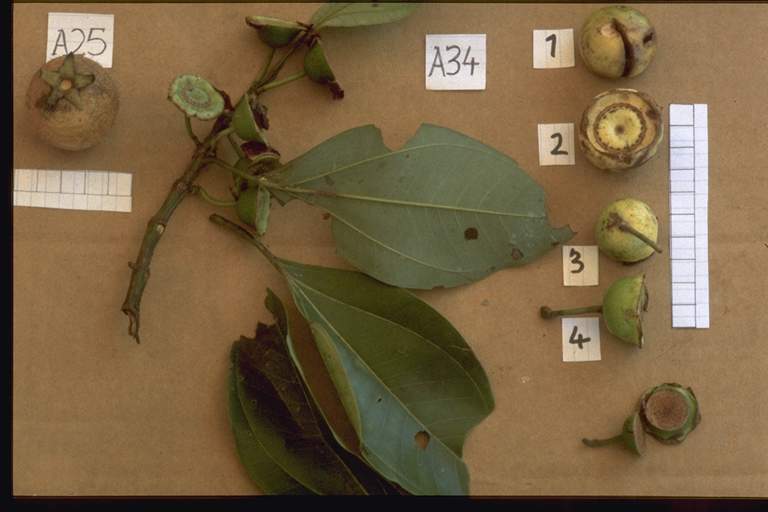 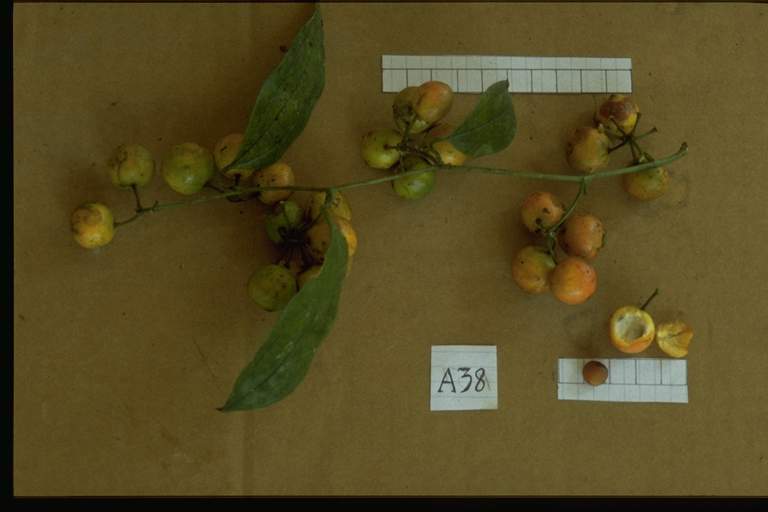 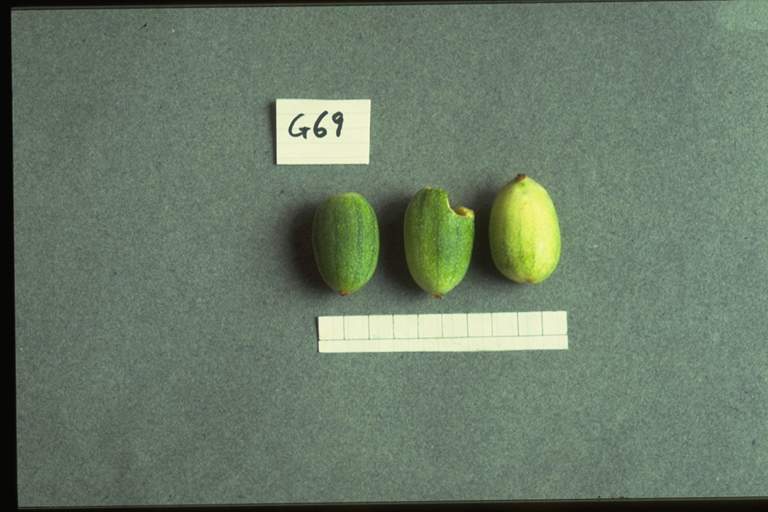 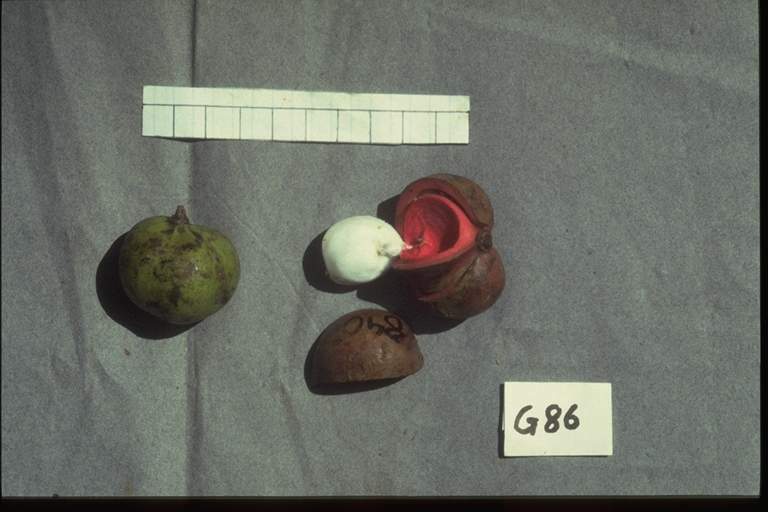 Immature fruits eaten by Cebus apella. 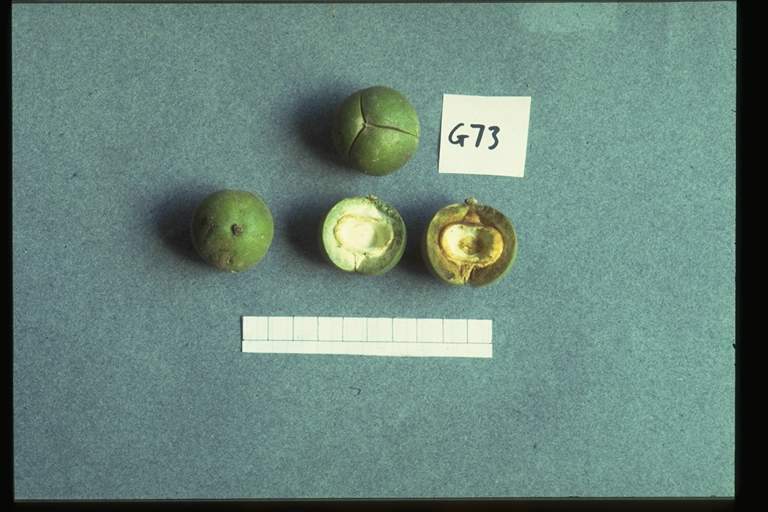 Eaten by Alouatta seniculus, Cebus apella . 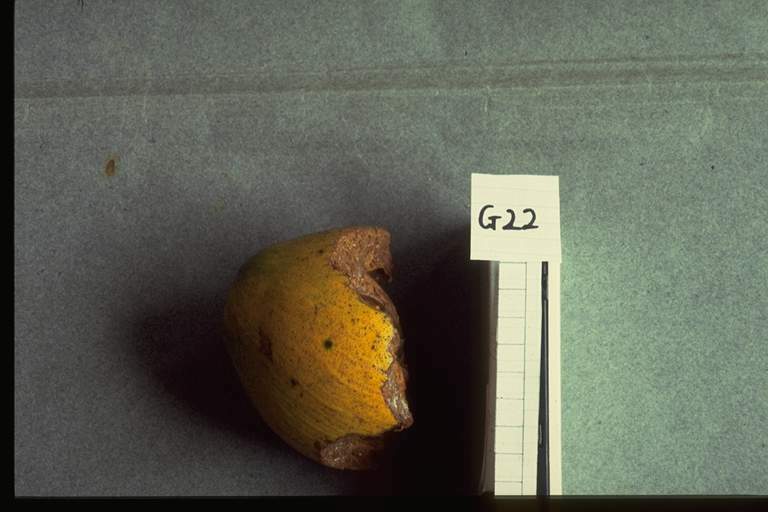 Eaten by Alouatta seniculus, Cebus apella. 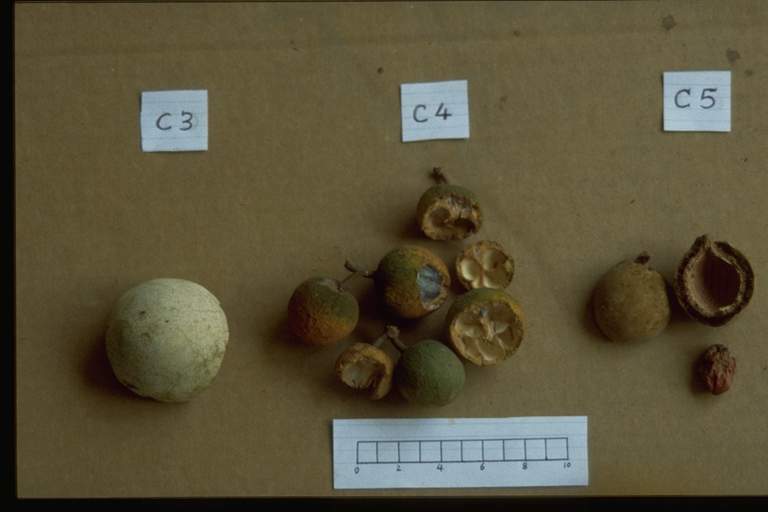 Immature fruits eaten by Cebus apella. 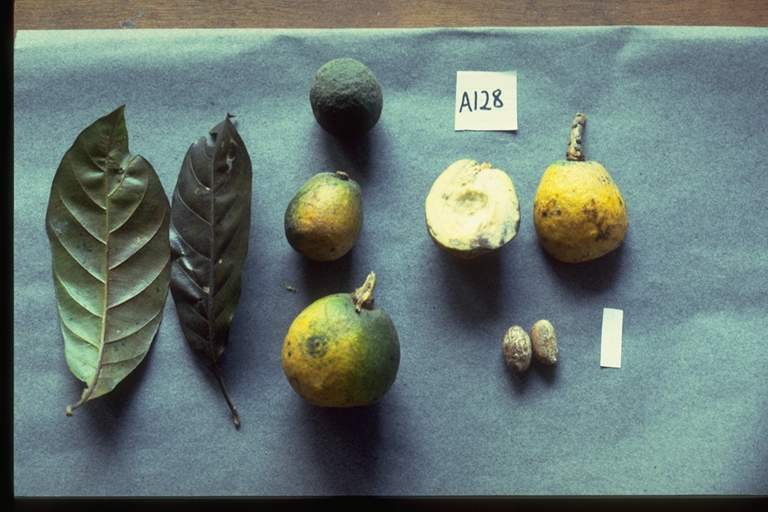 Fruits exhibit several colours. 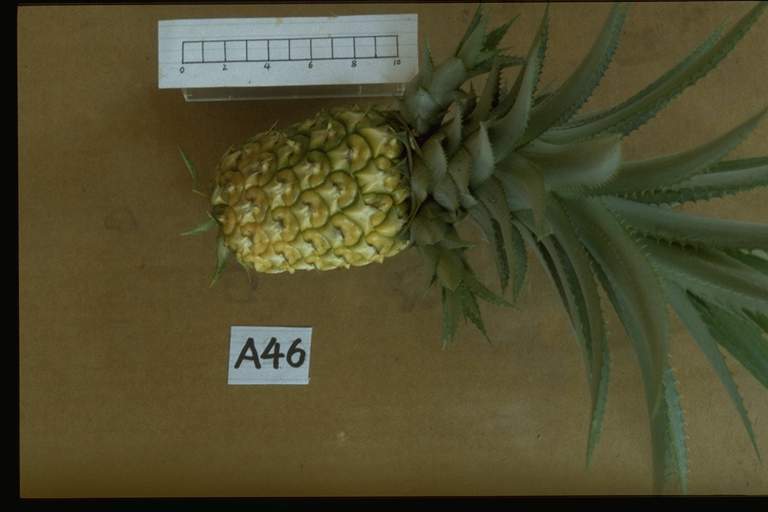 Ground-level herb. 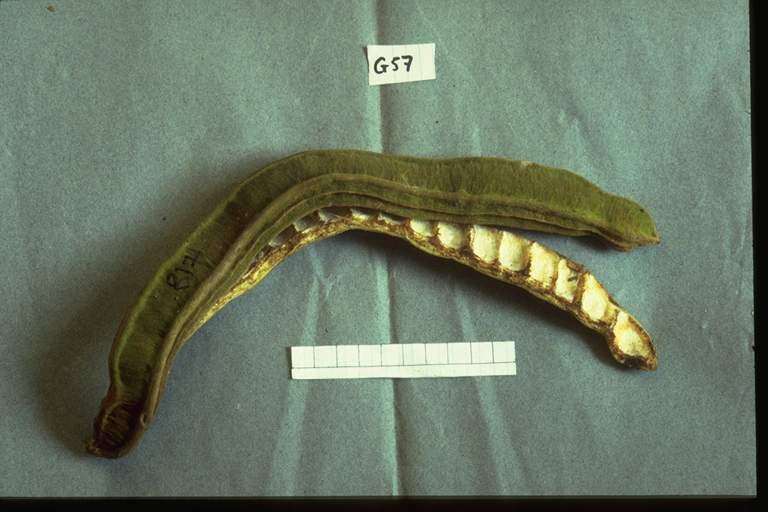 Eaten by Cebus apella. 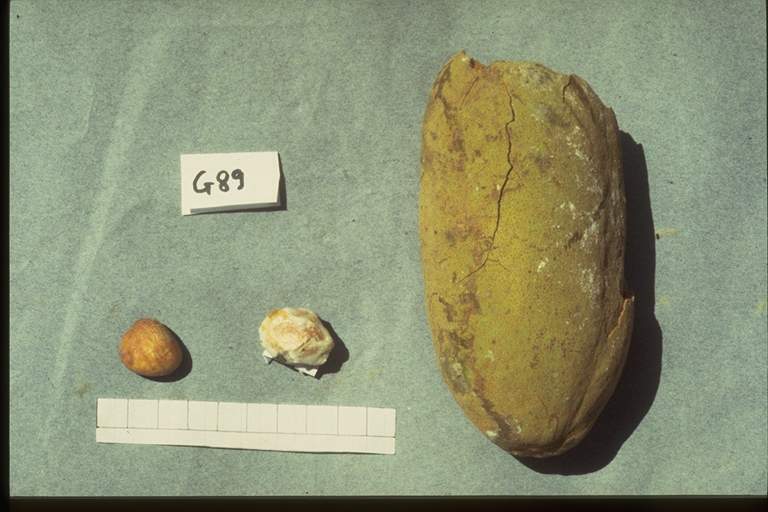 Primates at Nouragues have not been observed eating this fruit. 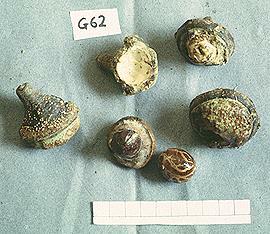 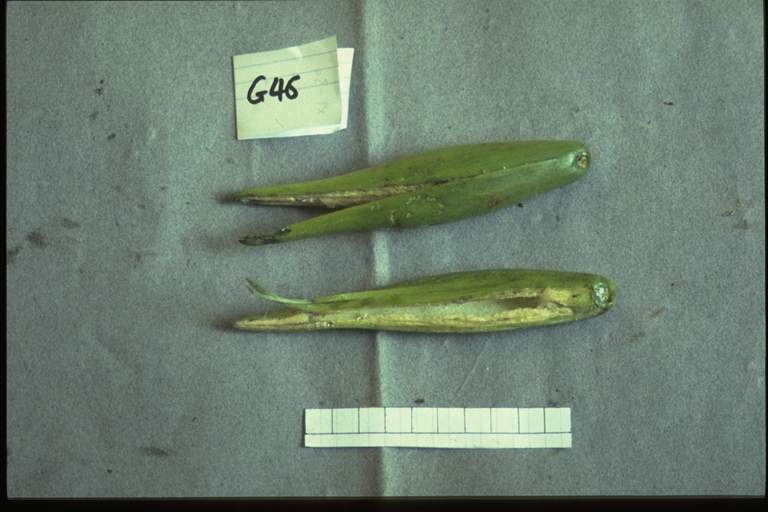 Dehiscent fruit, valves drop off when mature to reveal white arillate seeds. 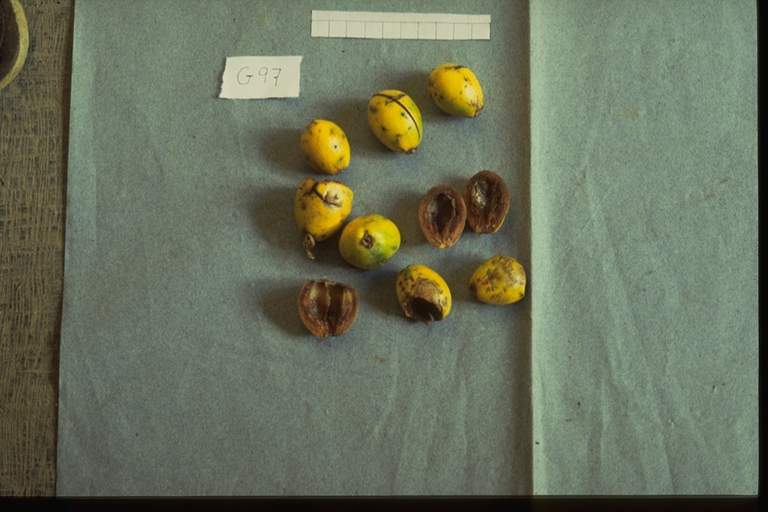 Eaten by Alouatta seniculus, Cebus apella. 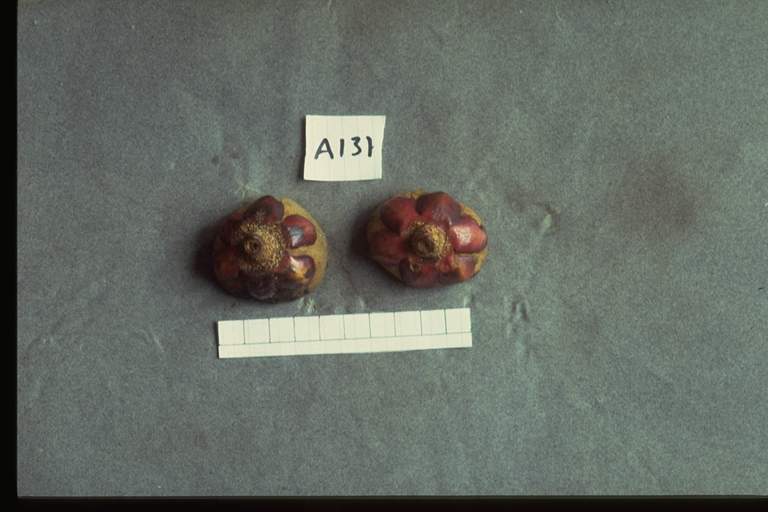 Dehiscent fruit, red valves drop off to reveal white arillate seeds. 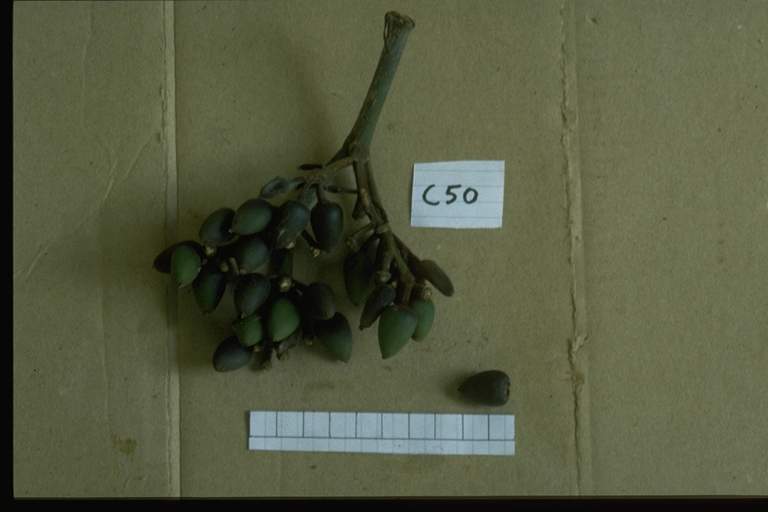 Eaten by Ateles paniscus. 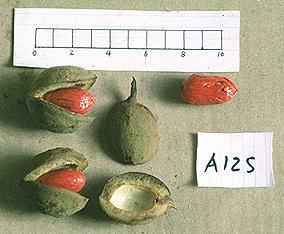 Dehiscent fruit, valves drop off when mature to reveal white arillate seeds. 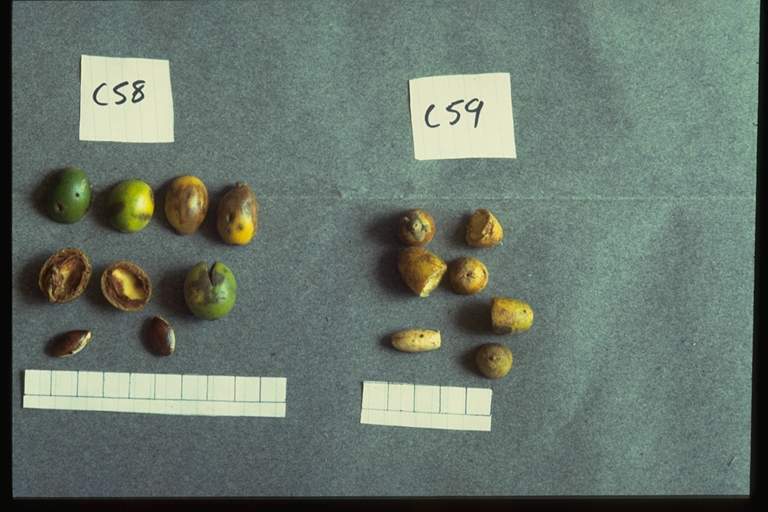 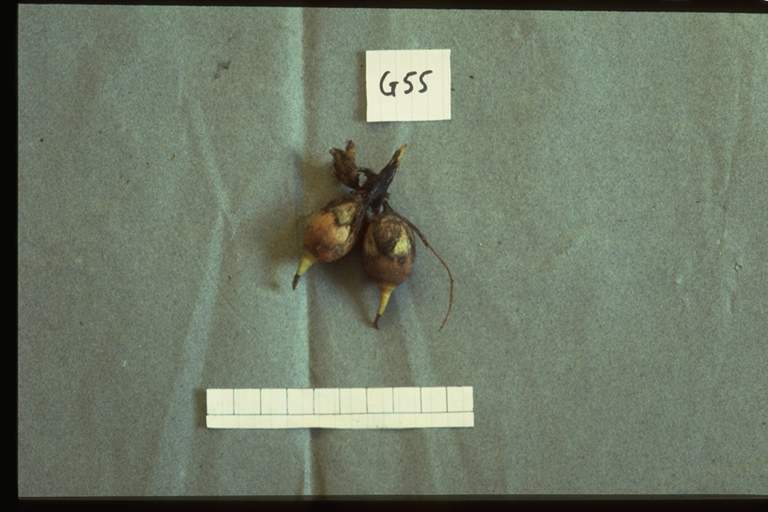 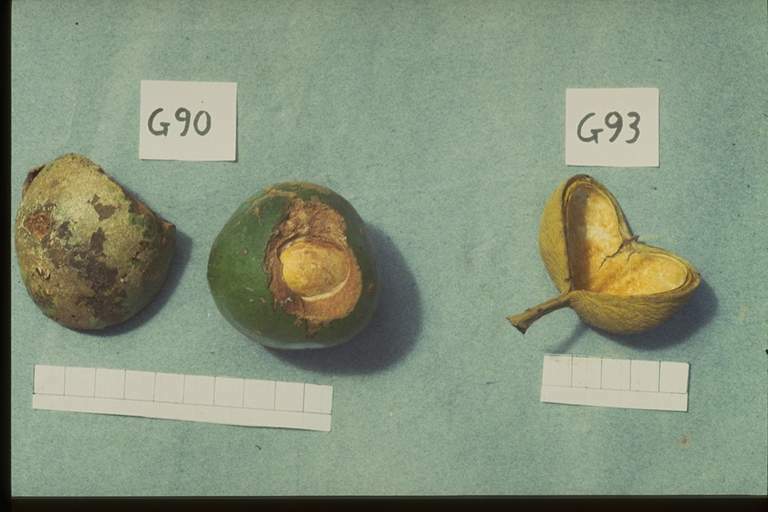 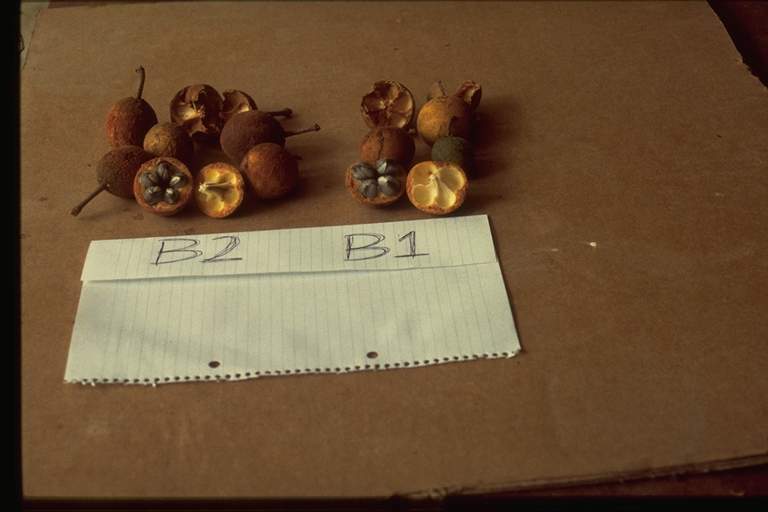 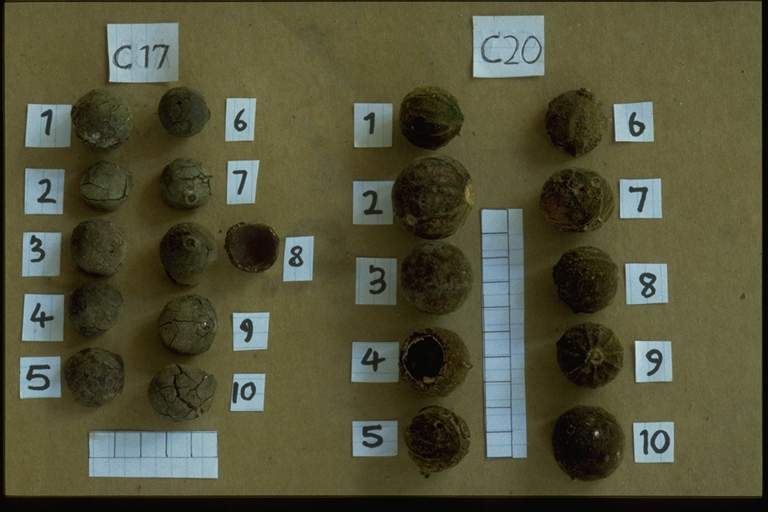 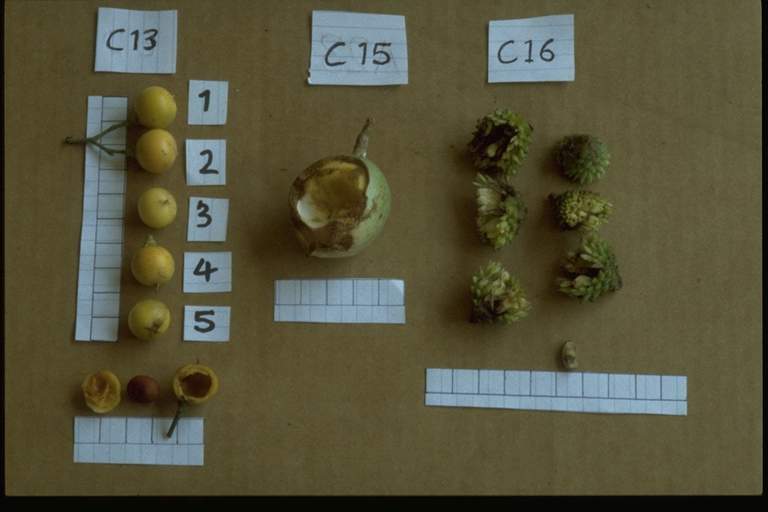 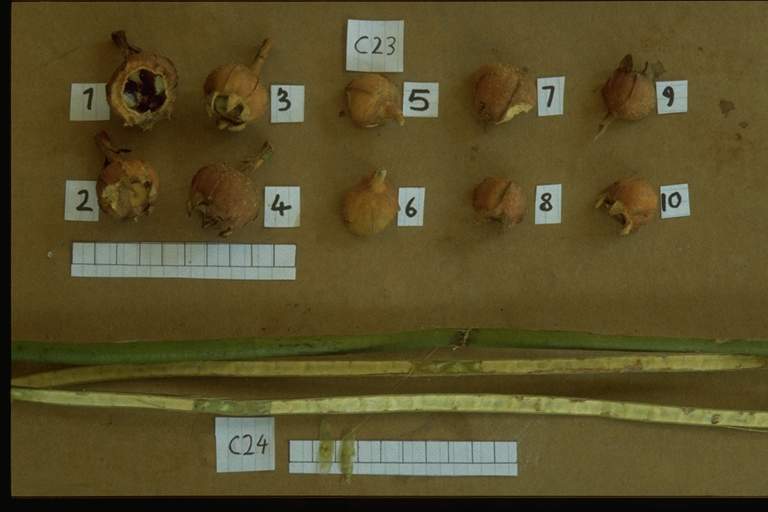 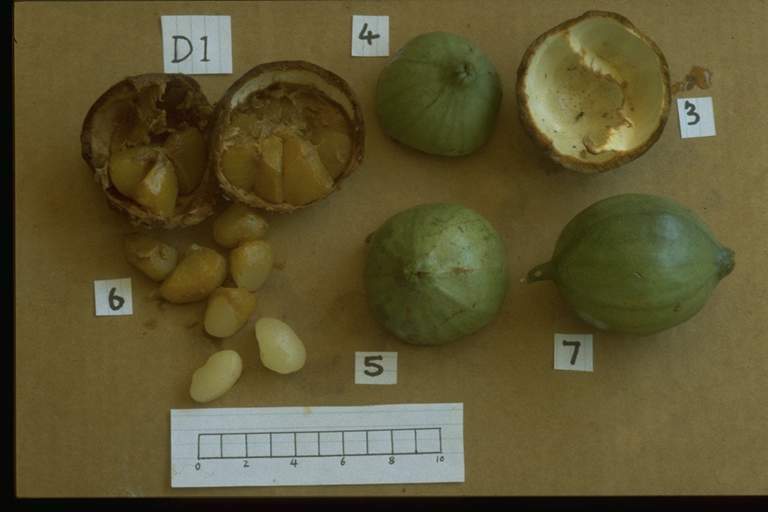 Immature fruits eaten by Alouatta seniculus, Cebus apella. 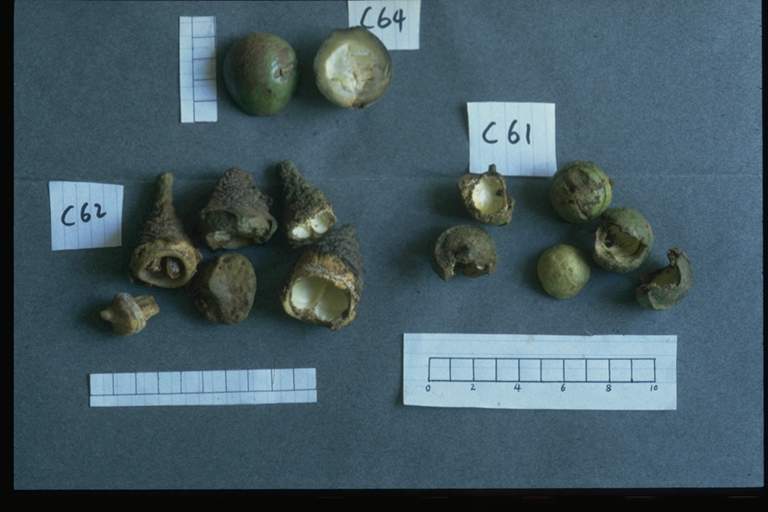 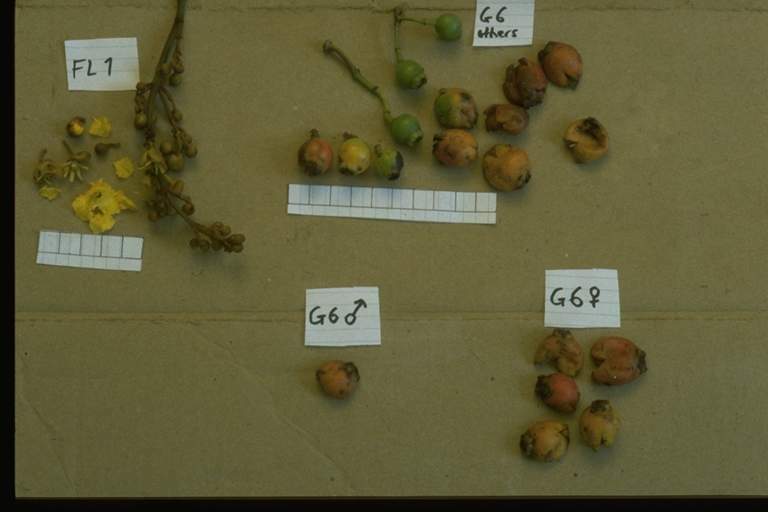 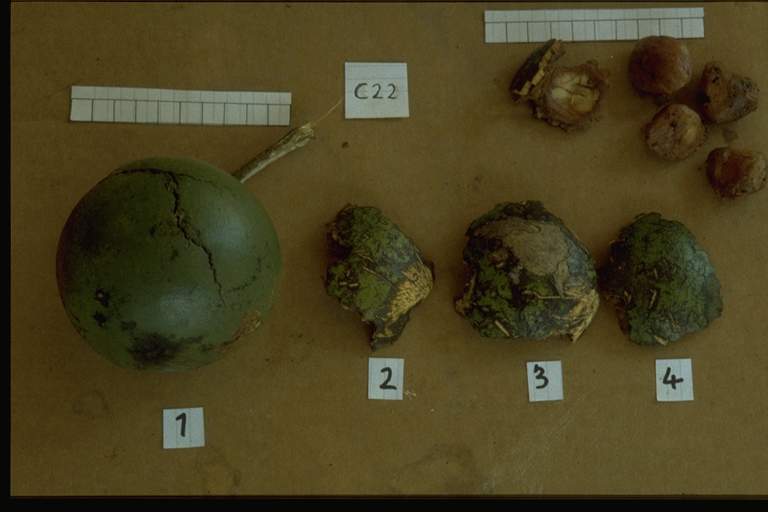 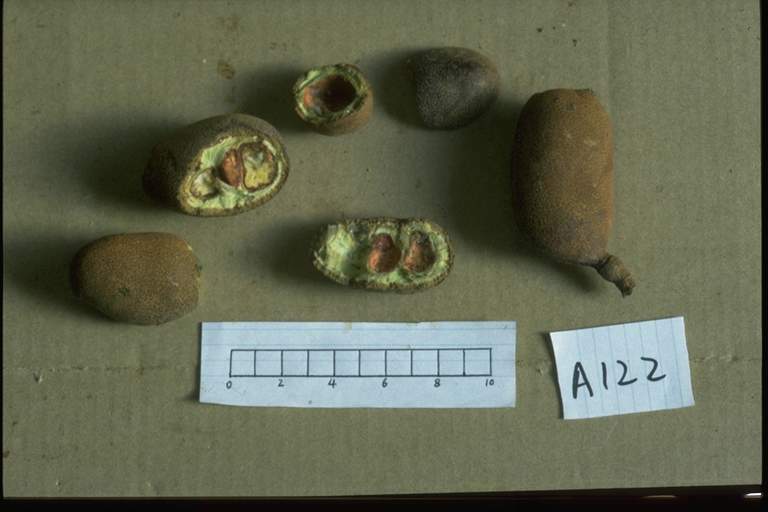 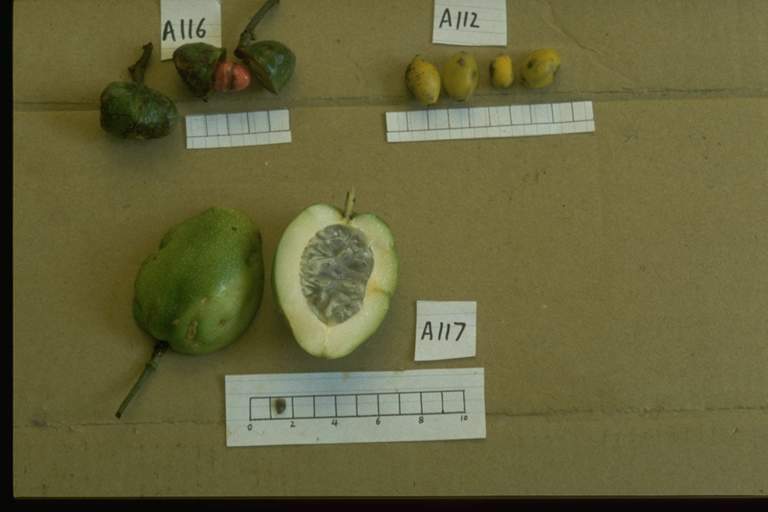 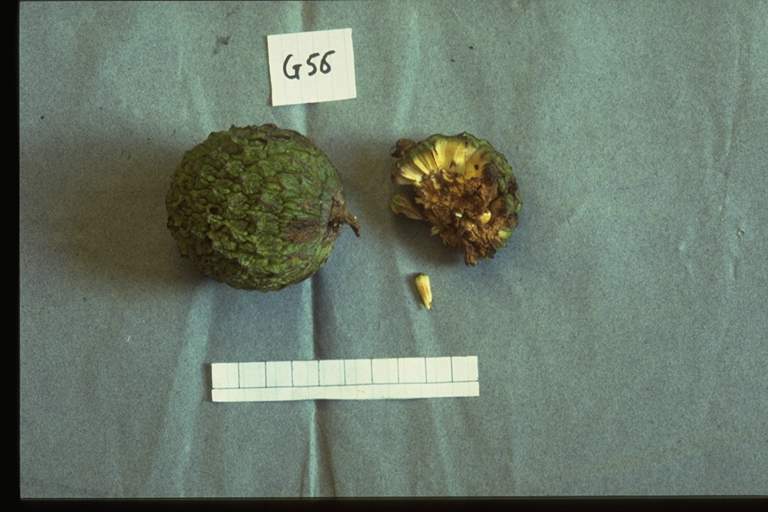 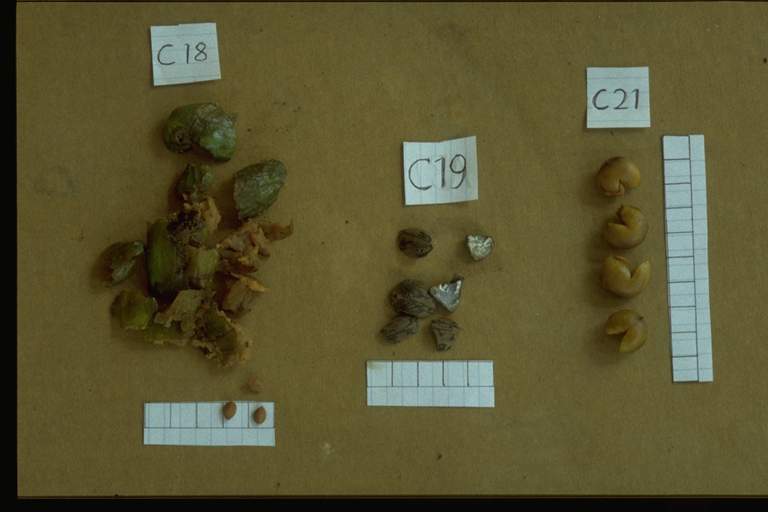 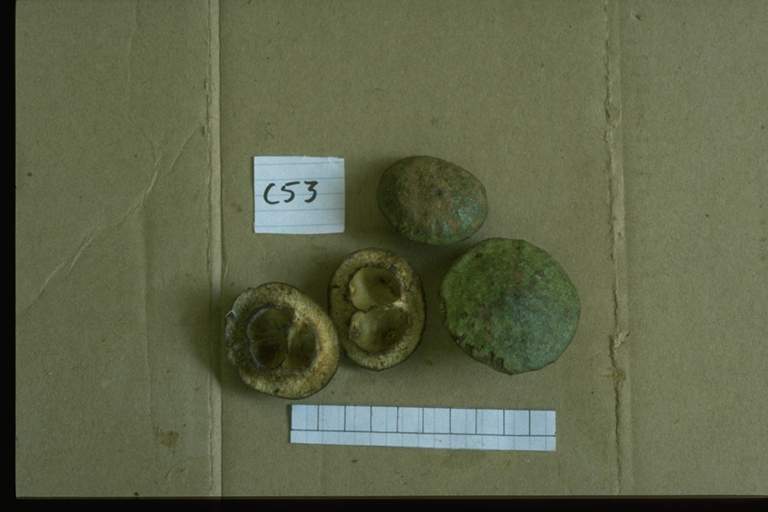 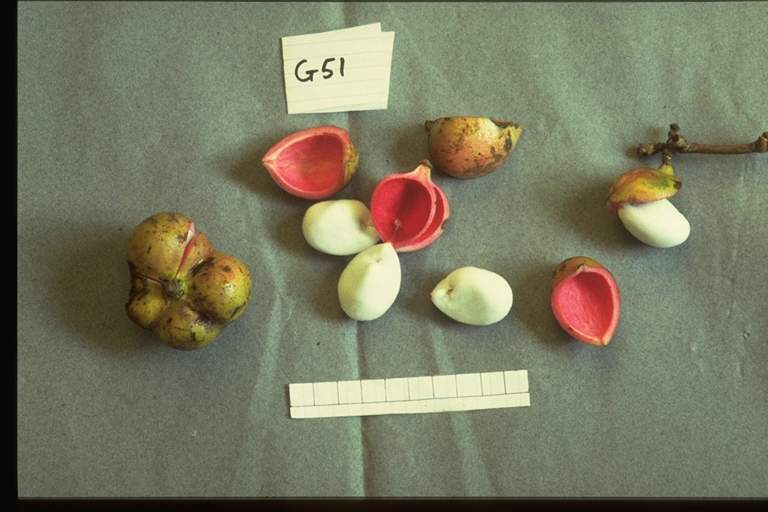 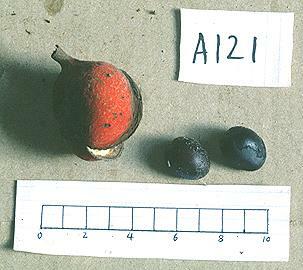 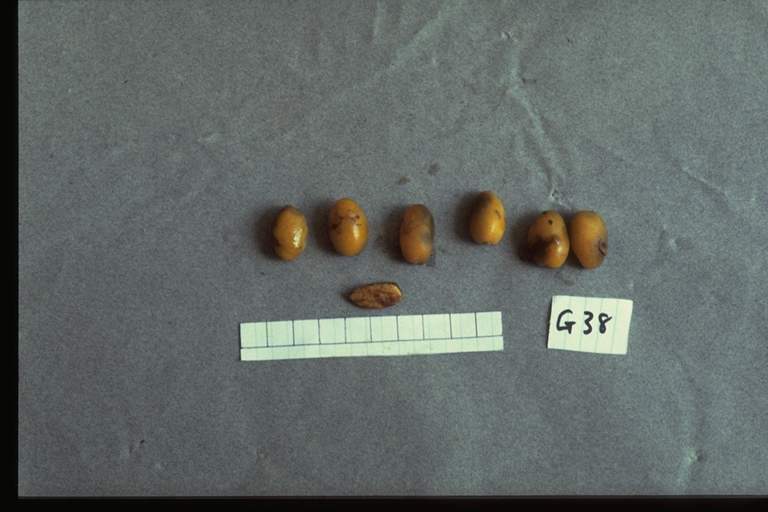 Immature fruits eaten by Alouatta seniculus, Ateles paniscus. 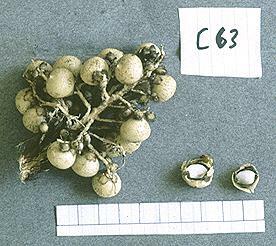 Eaten by Cebus apella. 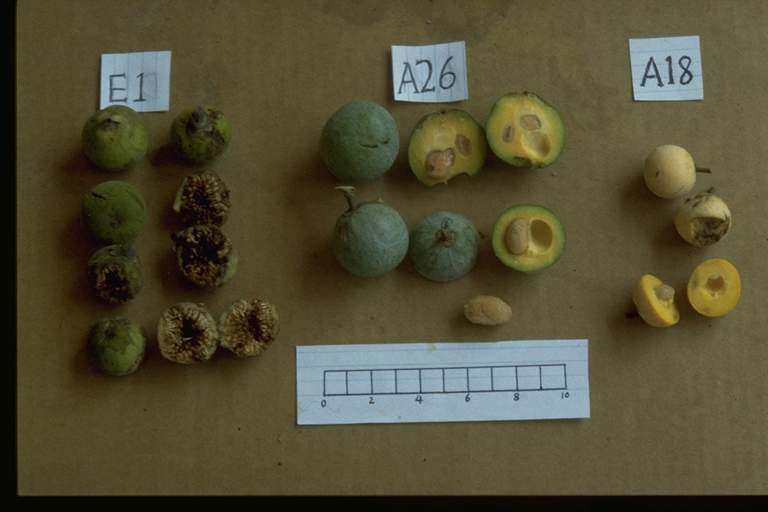 Fruit is a dehiscent capsule consisting of a seed container (pyxidium) with a lid (operculum) which drops off when fruit is mature. 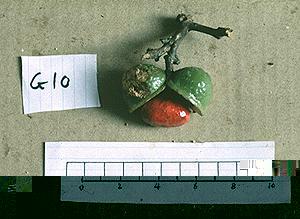 Eaten by Cebus apella. 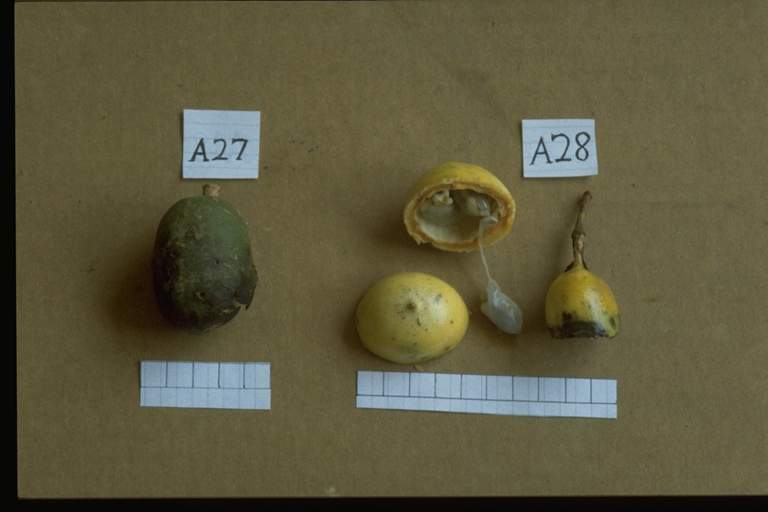 Unlike other Lecythidaceae listed here, this fruit is indehiscent and contains seeds surrounded by a juicy pulp. 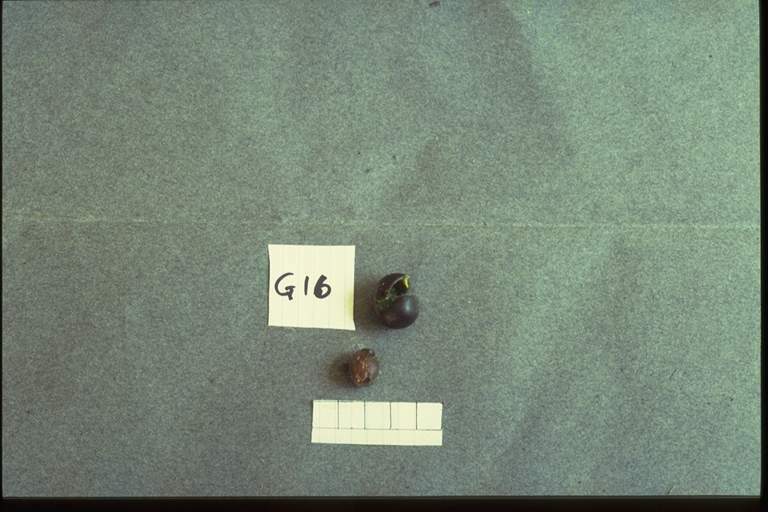 Not observed being eaten by primates at Nouragues. 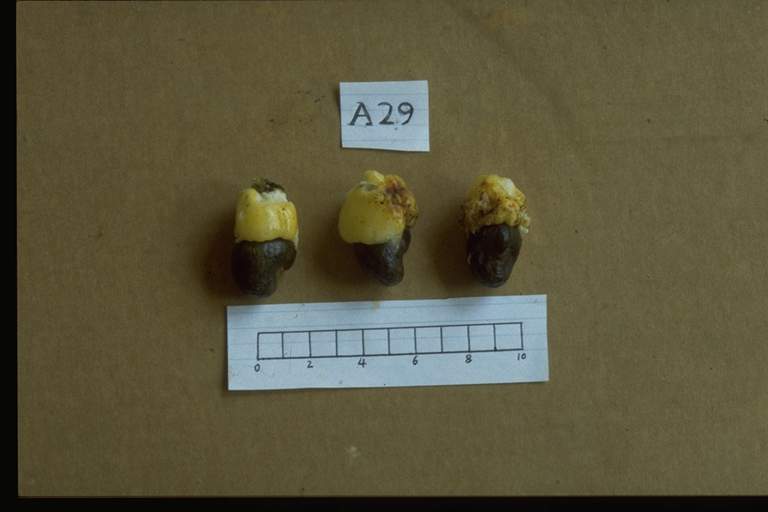 Eaten by Alouatta seniculus, Ateles paniscus. 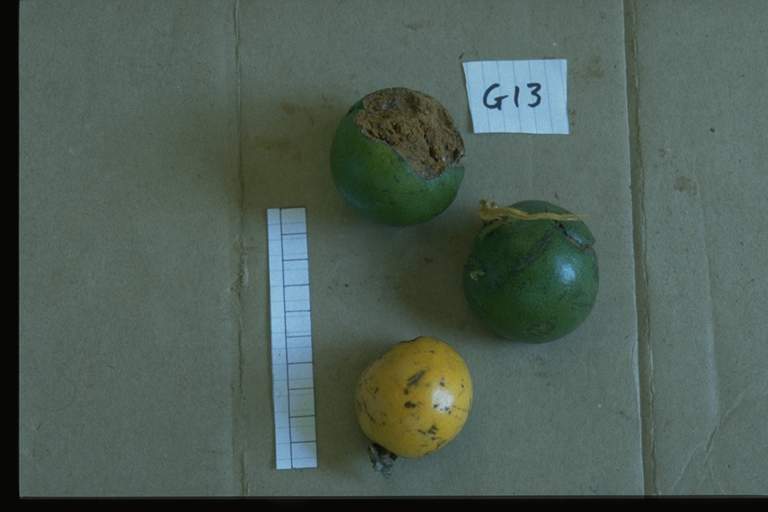 Eaten by Alouatta seniculus, Ateles paniscus.Fruit is dehiscent, green valves opening to reveal a red arillate seed. 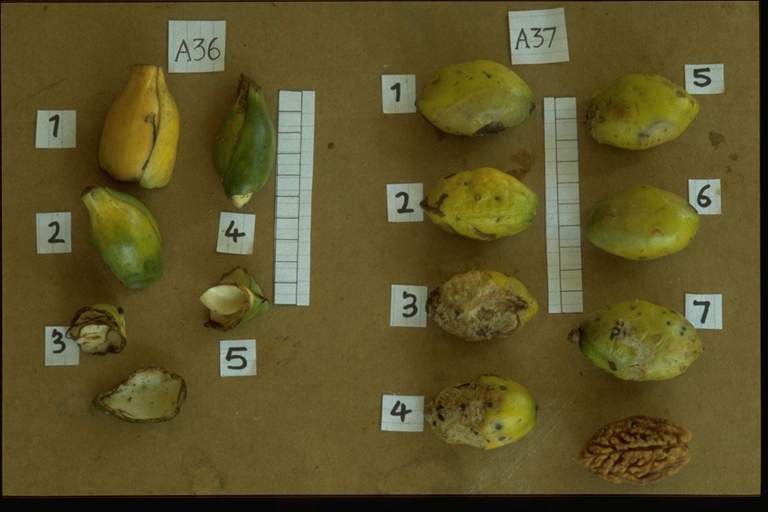 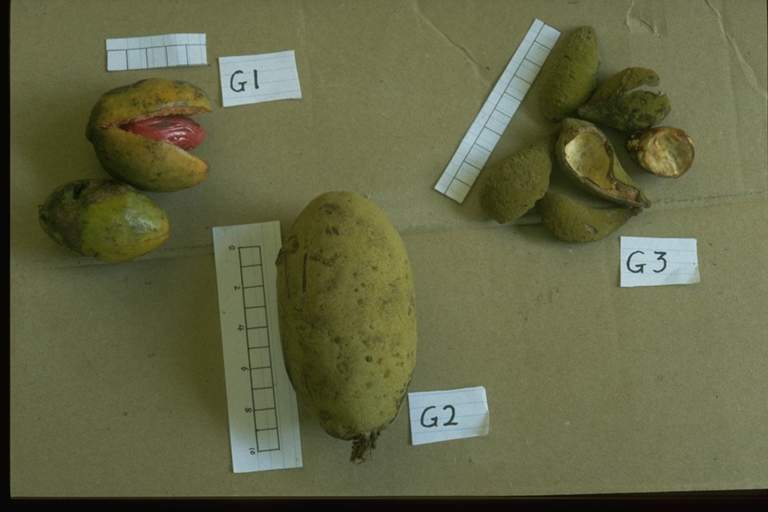 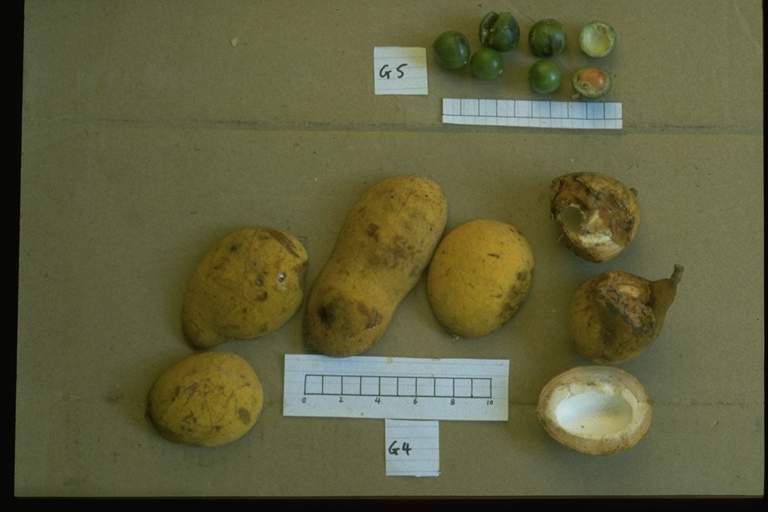 Fruit not observed being eaten by primates at Nouragues. 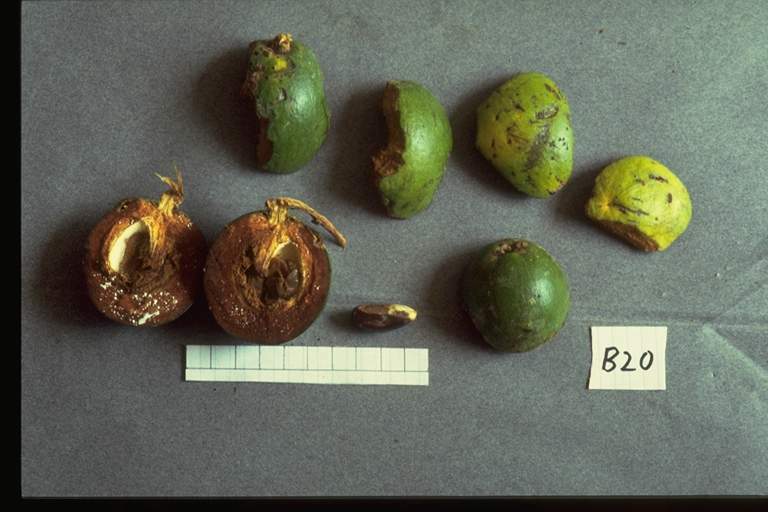 Eaten by Alouatta seniculus, Ateles paniscus.Fruit is dehiscent, brownish-green valves opening to reveal a red arillate seed. 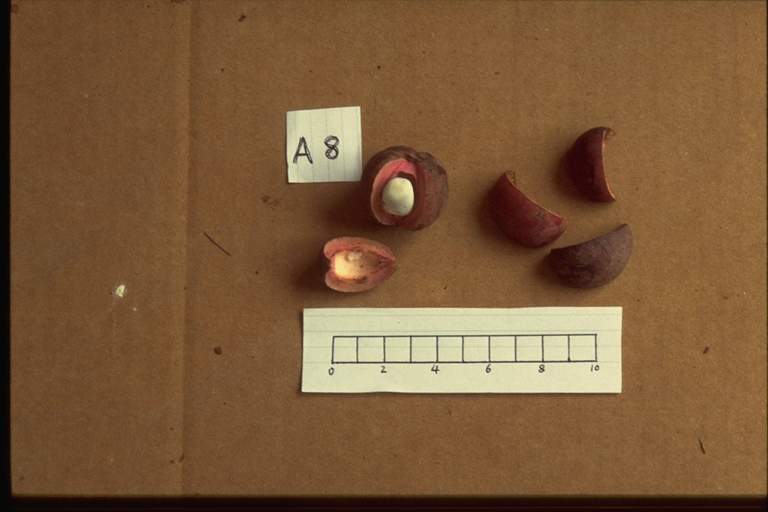 Eaten by Alouatta seniculus, Ateles paniscus.Fruit is dehiscent, yellow valves opening to reveal a red-pink arillate seed. 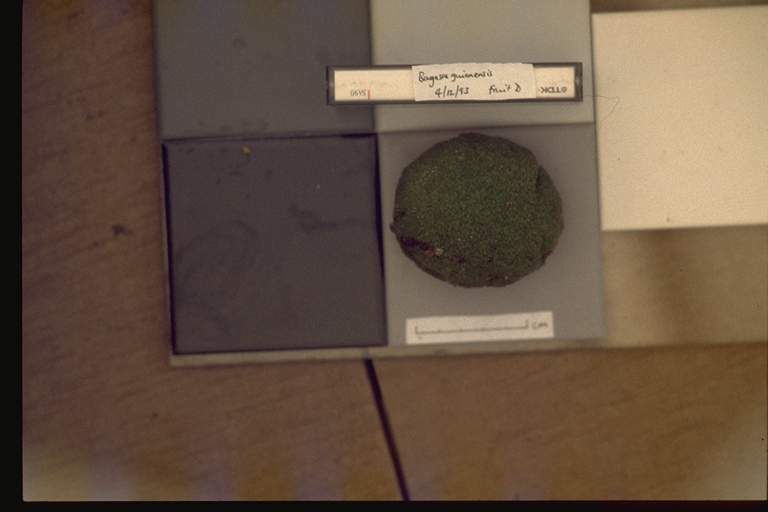 Ground level herb. 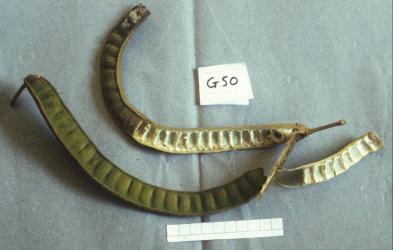 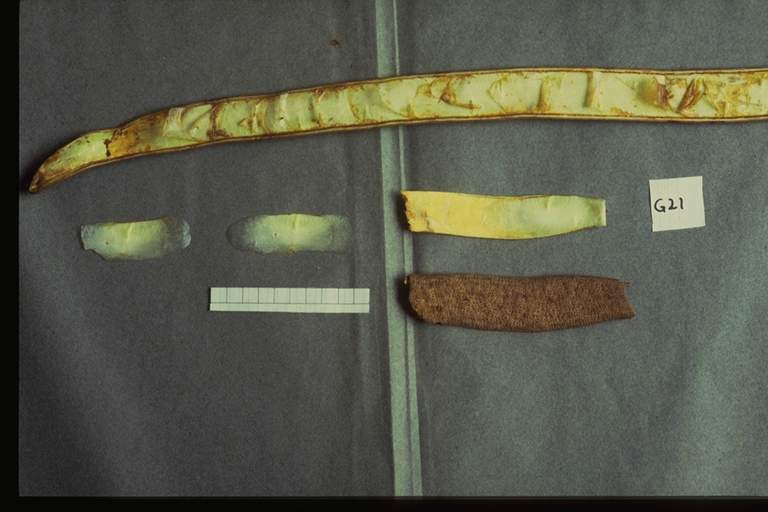 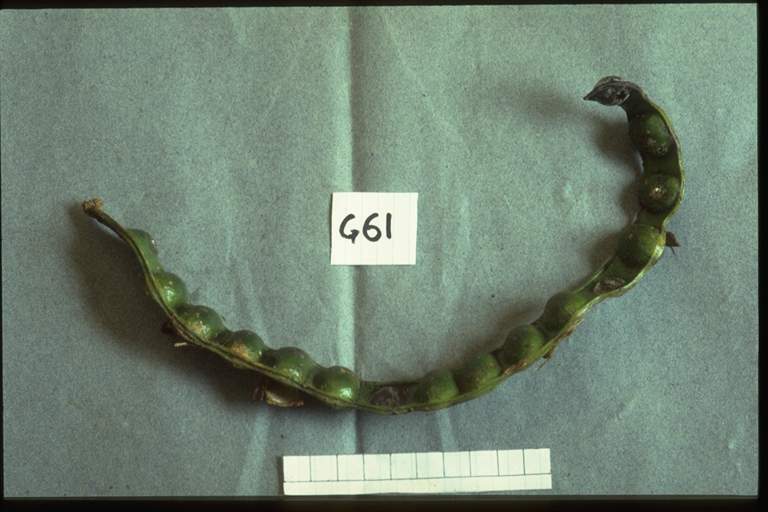 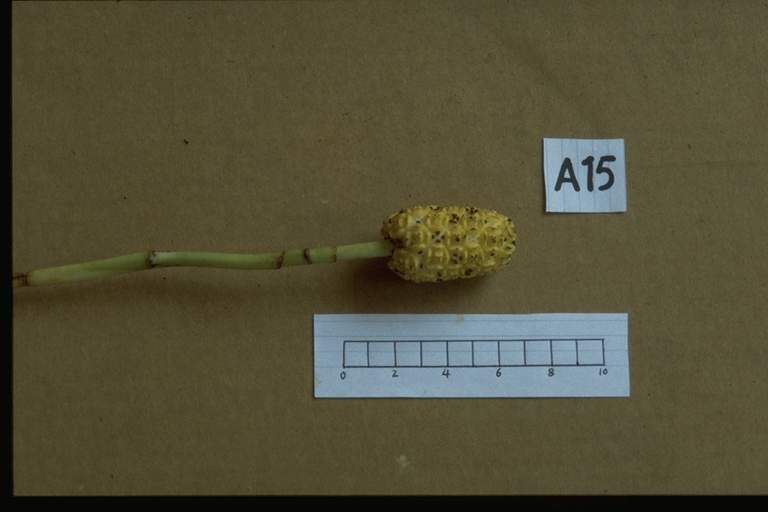 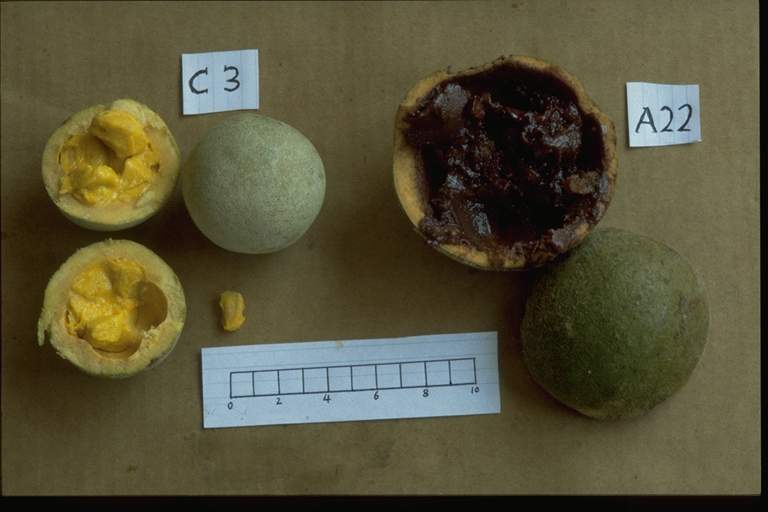 Primates at Nouragues have not been observed eating this fruit. 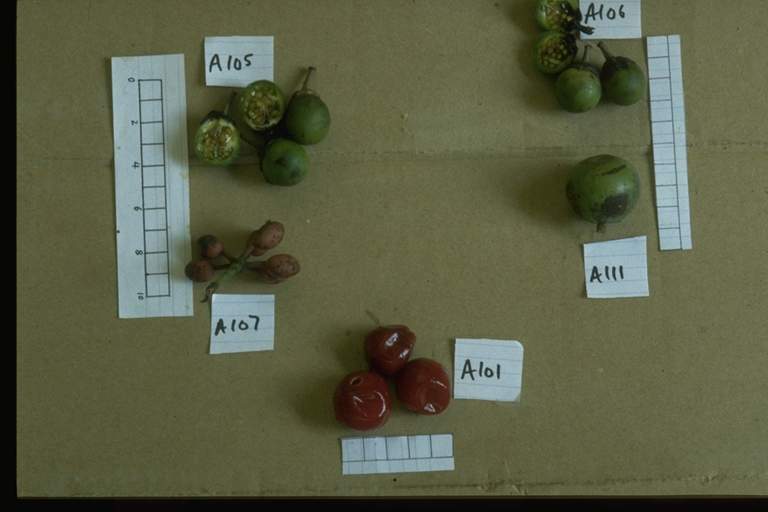 Eaten by Alouatta seniculus (mature fruits) and Ateles paniscus (immature fruits). 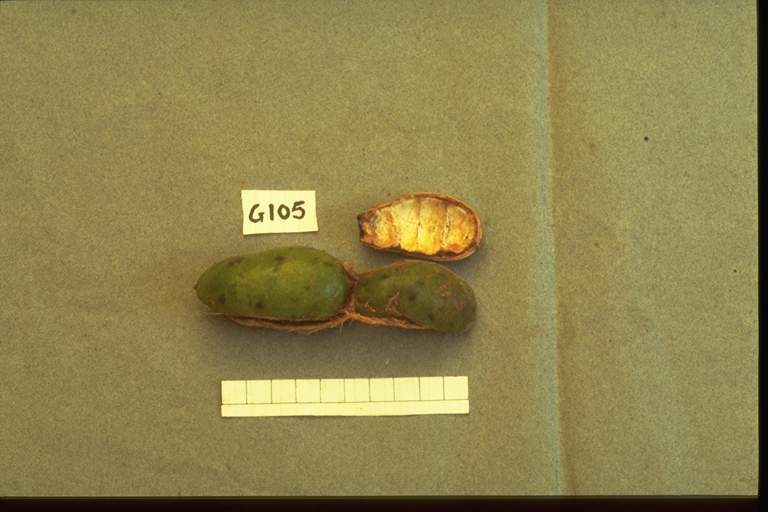 Eaten by Cebus apella. 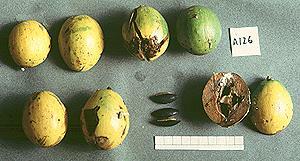 Fruit is a dehiscent capsule, which opens to reveal black seeds. 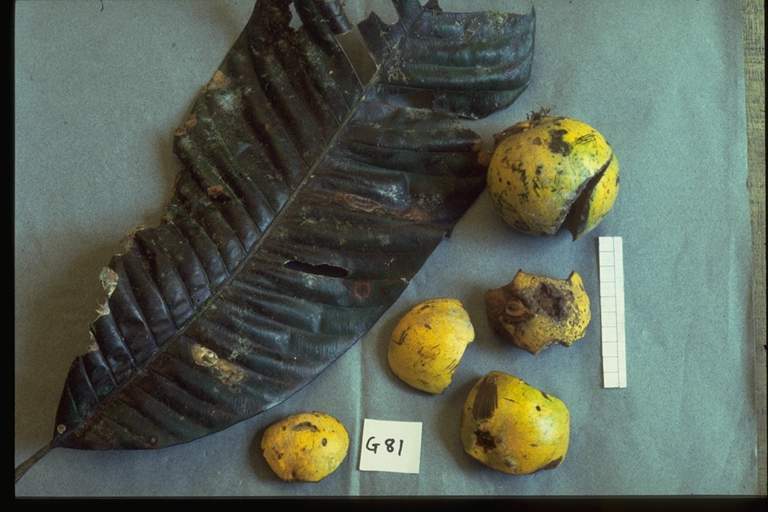 Eaten by Ateles paniscus. 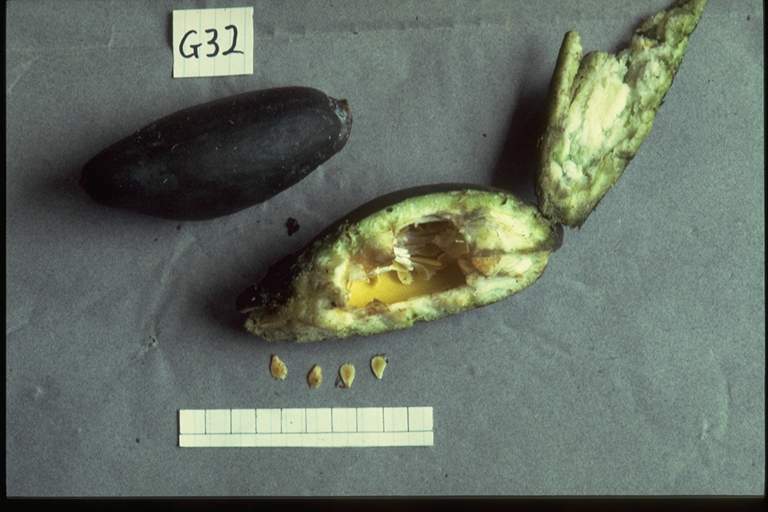 Fruit is a dehiscent capsule, which opens to reveal black seeds.